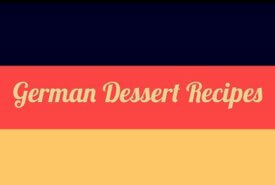 These traditional German pancake recipes will serve to make any meal extra special. The pancakes are more dessert-like than common North American pancakes, especially those with apples. And you must absolutely try the popular Berliner pancakes that are essentially a sweet pastry to die for. The traditional Berliner Pfannkuchen consists of a holeless, marmalade or jam-filled doughnut; it's made of a sweet raised dough and is often iced or powdered with sugar. It's also known as a Krapfen, Kreppel, or Berliner. Berlin pancakes are said to have been invented in 1756 by a Berlin confectioner, once a regimental field baker in the Prussian army, and jam fillings became popular in the 1800s. 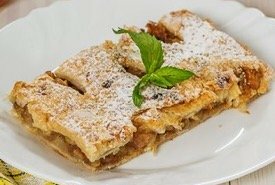 "Berliners" are traditionally served on New Year's Eve (Saint Sylvester Day), though they're a very popular dessert pastry eaten and enjoyed throughout the year. As a joke, one Berliner is secretly filled with mustard and served with the others. Berliners are called Paczki (Punch-key) in Poland where they are served on Fat Tuesday (Ostatki), the day before Ash Wednesday. For the dough take 1 cupful of milk, 1/2 pound of clarified butter, 1 whole egg and the yolks of 5 eggs, scant 2 ounces of yeast, 2 ounces of sugar, a teaspoonful of salt and flour. For filling, currants, cherries, jelly, or marmalade. Flour and butter are warmed. Then whip the eggs, stir the lukewarm milk with the eggs, yeast, butter, sugar, salt, and flour into a dough which is beaten until it bubbles, and no longer sticks to the spoon. Then set it aside to raise. When this is done roll it out to about the thickness of one-half inch and put a teaspoonful of the fruit jelly or marmalade 2 inches apart on half of the dough and lay the other half over this, and then with a glass cut so as to have the dots of jelly in the center of the cakes, and let them raise again. Then heat the fat, put the cakes in side-by-side with the tops to the bottom, putting in just enough cakes to cover the fat. They must be of a dark yellow color, and when done turn in powdered sugar or sprinkle with sugar and cinnamon; serve fresh. If wished they can also be frosted. When baking cakes in which yeast is used, for instance "Berlin pancakes," the upper side is put into the fat first. Shake the kettle occasionally and when brown from below turn the cakes with a fork, and when the top is brown also take them out, lay them on a piece of absorbent (blotting) paper for a while, turn in powdered sugar, and dust some of this over the top. 1 pound of warmed flour, 2 ounces of butter, the same quantity of pounded almonds mixed with a few bitter ones, 1 cupful of milk, 1 whole and the yolks of 4 eggs, 2 tablespoonfuls of rosewater, 1 tablespoonful of sugar, a little salt, yeast dissolved in a little milk. Warm the milk and the butter, stir in eggs, rosewater, almonds, spices, yeast and flour, beat the dough and lay it on a molding board dusted with flour. Then take small pieces of the dough, form them into little rings and set aside to raise. Then bake in lard the same as the "Berlin pancake recipe," beginning with those which were made first. They must be of a light yellow color. While hot roll in sugar and cinnamon. Take 2 soup-platefuls of finely sliced apples, cook them until done with sugar, lemon peel and enough wine until there is no more juice. Then beat the yolks of 6 eggs with a cupful of thick, sour cream, 2 tablespoonfuls of cornstarch, a little salt, and cinnamon, mix the beaten whites through this and bake two cakes on one side to a light brown. After the second is baked, spread with apples, put the cakes one on the other and put them into the oven for a few minutes, sprinkle with sugar and serve. Take 12 sour apples, 1/4 pound of butter, 12 crackers soaked in milk, 6 eggs, 1/4 pound of currants, 2 tablespoonfuls of sugar, lemon peel and cinnamon. Pare the apples, slice and cook with butter over a slow fire until done. Then pour over the crackers enough milk to soak them, beat 4 eggs to a froth; stir the ingredients with the crackers, adding at last the apples and the whites of the eggs; 2 tablespoonfuls of rum may also be stirred with the apples. Bake the apple omelette on a slow fire. German pancakes are very good as a dessert. Beat two eggs very light, add one half cup of milk, and stir in flour enough to make a very thin batter. Before thinning it very much, add a teaspoon of baking powder and a pinch of salt. Bake this mixture, in the form of little griddle cakes, on a moderately hot griddle, and when done, drop currant or raspberry jelly in the center of each, roll them up, and serve with some more of the jelly. Mix 1/4 pound of butter with 6 tablespoonfuls of sugar. Add the yolks of 5 eggs, 1/2 cup of milk, 1/2 pound of sifted flour with 2 teaspoonfuls of baking powder, a pinch of salt, and the grated peel of a lemon. Mix well; add the whites beaten stiff and bake in a well-greased waffle iron. Sprinkle with pulverized sugar and serve hot. For this German pancake recipe, whisk the yolks of 5 eggs with 1 pint of cream, or rich milk, and beat the whites very stiff. Add to the yolks and cream 4 ounces of flour and 1 tablespoonful of sugar, 1 ounce of raisins, and 1 ounce of chopped almonds. Then add the beaten whites, stir and fry on a griddle with 2 ounces of butter, either whole or in 3 parts. Let it brown; when light, sift it with sugar and serve with preserves or hot vanilla or wine sauce.